world. In Holland, St. Nicholas was referred to as “Sinterklaas”. In Germany, Switzerland, and the Netherlands, shoes and stockings were left outside the door, hoping for some candy or treats from St. Nicholas. However, naughty boys and girls would wake to find only a lump of coal as their present. In 325 AD, a priest named Arius was gaining followers and considerable support with his claim that Christ was created and not equal to God. Arianism flatly denied that Christ was present during creation and it brought into question the existence of a triune God. Arius made his argument at Nicaea after Emperor Constantine called together a council of Christian leaders to form a doctrine of unity within the church. As Arius made his argument, the Bishop of Myra quickly put Arius in his place by simply quoting one line of scripture, “In the beginning was the Word, and the Word was with God, and the Word was God.” John 1:1 And with that, the Bishop of Myra, also known as Jolly O’ Saint Nick, punched Arius out. Nicholas’ strong efforts in defending the faith, along with other church leaders, led to what is known as the Nicene Creed, a statement of faith repeated in churches to this very day. (see Trinity Or Not Trinity) St. Methodius stated, "thanks to the teaching of St. Nicholas the metropolis of Myra alone was untouched by the filth of the Arian heresy, which it firmly rejected as death-dealing poison." This, my dear Liberty, is the true Santa Claus. He is not a marketing gimmick to turn our attention away from Christ and his birth, but rather a defender of the faith and voice in the wilderness calling people back to God. As Christmas nears and talk begins of Black Friday sales and images of reindeer and a white bearded man in red selling Coca Cola make their rounds, perhaps it’s good to go back and learn the truth of who St. Nicholas really was. Almost 300 years after Christ, in the ancient city of Patara, located in modern-day Turkey, a baby boy was born to a wealthy Christian couple. They named him Nicholas and brought him up in the faith. While he was young, an epidemic swept the country and took the lives of his parents. He was taken in by his Uncle Nicholas, who was the Bishop of Patara, and raised in the church. As a teenager, he traveled to the Holy Land, experiencing where Jesus lived, died and rose again. Legend tells that on his return trip to Patara a tremendous storm arose, threatening the safety of the ship and all aboard. Nicholas prayed for protection and the sea calmed, sparing the ship and all the lives onboard. Because of this act, Nicholas was declared the patron saint of sailors and voyagers. Nicholas believed God called him to the ministry so he began his journey as a servant of the Lord. Over time he became a bishop and served the city of Myra, also in modern day Turkey. A fervent follower of Christ, he passionately spread the Gospel. This did not sit well with the Roman Emperor Diocletian, who in 303 AD directed the capture and torture of all Christians before throwing them in jail. Nicholas was arrested and imprisoned. He was severely beaten for his faith several times but never lost sight of his calling. While imprisoned he defended some other prisoners who were unjustly charged, adding to his legacy of humanity and justice. Once Emperor Constantine, the first Roman Emperor to embrace Christianity, assumed power in 306 AD, all Christian prisoners were released. Bishop Nicholas returned to Myra where he continued to profess the Good News of the Gospel. Over time these stories and traditions were brought to America, modified and changed. 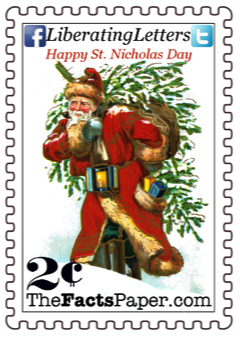 Clement Clarke Moore wrote the poem An Account of a Visit from St. Nicholas in 1820, which made St. Nick a heavy, jolly man who slides down the chimney. Moore also gave St. Nick eight flying reindeer. In 1881, cartoonist Thomas Nast gave St. Nick the red suit with white fur trim, making St. Nick’s transformation into Santa Claus complete. As is common, most legends grow out of some bit of reality. Actual events are embellished and fantasized with variations in each story and tale but it is the grain of truth that is often the most remarkable. We do know there was a Saint Nicholas and that he was an incredibly faithful, God-fearing man who quite literally fought for the Gospel. He was even tortured and imprisoned for his beliefs, but refused to deny his Lord and Savior. He obeyed the words of Christ and used his wealth and good fortune to help the needy and poor. His legacy remains a map for each new generation that constantly points them to Jesus. 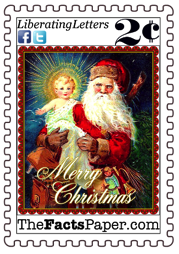 So yes, Liberty, there is a Santa Claus, and he was an amazing follower of Christ. So don’t get distracted by the modern understanding of the jolly old man who gives you presents on Christmas. Focus instead on the bishop who risked his life and spent his family fortune professing and spreading the Good News of Jesus Christ. This is the Santa Claus you should remember. This is the Santa Claus you should emulate.